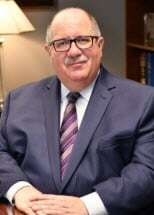 James M. Poerio is a shareholder in the firm. His practice is concentrated in the areas of workers' compensation and federal black lung defense litigation. His clients include major industrial employers in the transportation, communications, trucking and coal industries. He has extensive experience defending hearing loss claims as well as a wide variety of occupational disease claims, and traditional traumatic injury claims. He has also defended a wide range of cutting edge claims involving allegedly hazardous or carcinogenic workplace exposures. Jim was defense counsel in the landmark cases of Republic Steel Corporation v. WCAB (Petrisek) and Vitelli v WCAB (St. Johnsbury Trucking Co.), which established the principal that in Pennsylvania a voluntarily retired claimant is not entitled to wage loss benefits for a subsequent work-related disability. These appellate decisions eliminated an entire class of claims by retired workers and saved Pennsylvania employers and insurance carriers literally millions of dollars. He is an active member of the Claims & Litigation Management Alliance, where he serves as co-chair of the Workers' Compensation Committee; The National Council of Self-Insurers; and the Pennsylvania Self-Insurers Association. He is a member of the bar in all Pennsylvania state courts, as well as the United States District Court for the Western District of Pennsylvania and the United States Third and Fourth Circuit Courts of Appeals. Jim earned his undergraduate degree from Duquesne University in Pittsburgh, Pennsylvania, and his law degree from the University of Pittsburgh School of Law in 1981. He has been selected by his peers for inclusion in The Best Lawyers in America in the workers' compensation law category, as well as a Pennsylvania Super Lawyer, an honor accorded only the top five percent of attorneys in Pennsylvania. Republic Steel Corp. v. WCAB (Petrisek), 640 A.2d 1266 (Pa. 1994), Disability commencing after voluntary retirement is not compensable. Vitelli v. WCAB (St. Johnsbury Trucking Co.), 630 A.2d 923 (Pa. Cmwlth. 1993), petition for allowance of appeal denied, 641 A.2d 591 (Pa. 1994), Claimant's testimony that he retired voluntarily due to age bars subsequent claim for disability. Zinc Corporation of America v. WCAB (Byers and St. Joe Minerals Corp.), 603 A.2d 218 (Pa. Cmwlth. 1992), Although specific event precipitated second period of disability, WCJ may not properly find a new injury absent unequivocal medical opinion. The Road Toad, Inc., v. WCAB (McLean), 8 A.3d 922 (Pa. Cmwlth. 2010), U.R. Petition is de novo proceeding, so that WCJ may consider opinion of IME physician who did not examine claimant until after UR Determination is issued.